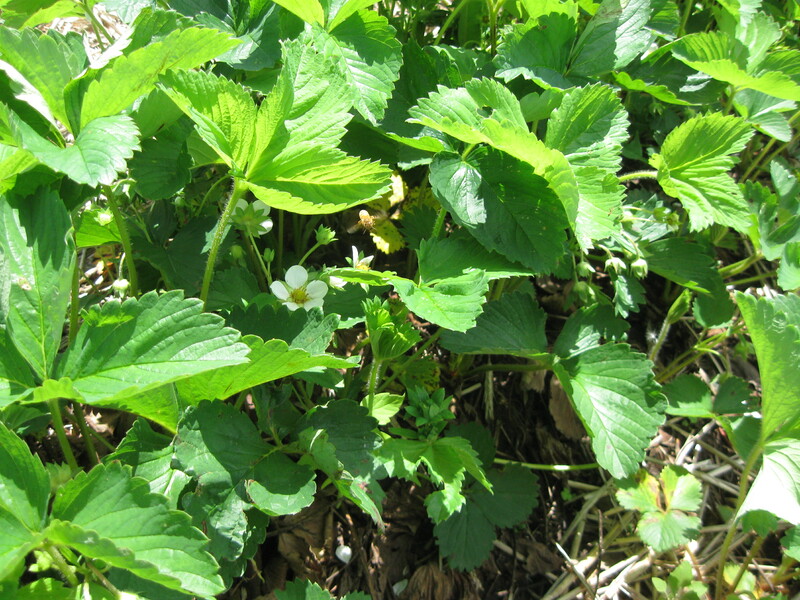 Can you find the bee working the strawberries? What an incredibly beautiful spring! We’re not sure if the long winter makes spring sweeter and greener, or if there’s something extra shiny out there this year, or what else is going on, but we have been extra impressed with the colors, sounds and growth of this last month. The warm sun and mostly moderate rains –almost once a week, the timing is excellent– have given us lots of time to work outside, and almost keep up with the long list of spring tasks. It was a cold and late start in the fields (as with the trees and other perennials), and our first round of greens, lettuce, spinach and radishes etc was planted a week or more later than usual. We’ve been planting and tending ever since, and we have some beautiful food to harvest for you this week and (dare we say) all the crops are off to a good start for good eating from now into next winter. So thank you for joining us in this CSA relationship! It’s a great thing, a farm this diverse supported and enjoyed by its community and supplying lots of healthy food. You’re part of a modern reinvention of the old-time traditions of getting food from your farm, yard or neighbor. We hope you love it every step of the way. Things have been on the move here since right after the storage share last November. In that short window before the freeze set in, we tore down the old greenhouse and one of our hoophouses too. We had some earth hauled in, and set up that old hoophouse (which was unheated in the back field) for a new greenhouse next to the driveway. It looks almost empty now, but this is where tens of thousands of your vegetables got their start, beginning in March. In mid-summer we’ll cure and store all the onions in there, and then the winter squash in September. We were bursting at the seams in the old greenhouse, and the added space, level ground and simpler ventilation have already made our work in there much easier and streamlined. Well, then we had the hoops and parts for this little old greenhouse that needed a home…so we set it up east of the barn and have tucked a couple small tractors and implements in there. After 8 years under tarps or just sitting out in the rain (in our front yard) this is a huge improvement! Hopefully there is a bigger pole shed on the horizon (the plans are drawn) to house the rest of the tractors and a comfortable shop to work in the winter. In our ninth season here, this farm has tangibly entered a new phase of change. We have been un-doing buildings and equipment that were big deals when they first happened (the greenhouse, hoophouse, various farm implements) and re-doing to better suit what we think we see unfolding here in the next couple decades. It’s fun. Soothing, in a way –knowing how much effort and sometimes stress went into each of those, finding out that though we did our very best they weren’t perfect for long, and accepting that. That perspective helps us relax into this stage, knowing that doing our best is just right, and now we’re equipped with a lot more knowledge about what will help us grow food for you and earn a living for us and our crew for years to come. Maybe there will be another multi-year undoing and redoing, or maybe it will just keep cycling as the years go on. This probably sounds familiar in your lives, and many of you could add some great words of wisdom to this! You’ll also see new signs in the barn to guide you in picking up your share. Easier to read, cleaner, and easier for us to put up and take down. Like most of us, it’s still a work in progress, but they might not all be down at vegetable-level any more, so you may have to learn to look up! All told, we’re having a good time giving it our best shot. We hope you enjoy the first fresh beautiful harvest!!!!! After a few weeks of salad, sandwich and stir-fry fixings, we’ll start having beets, carrots, broccoli, summer squash, cucumbers, and cabbage, and swiss chard. Sometime in later July the tomatoes start trickling in, along with peppers and eggplant. By August we hope to be swimming in the unbeatable mix of juicy and delicious warm-weather fruits and veggies. We often wish it would start right now, but spring and early summer eating is simply lighter and just as luscious! here to see what’s available and picking amounts. We’re so glad to have you on board! If you have questions about how the share works, please ask one of us. It’s your farm—please visit anytime. Get to know and enjoy the farm. Check in on the crops as they grow, walk the path down by the honey bees, or feed the chickens some grass through the fence (they’re young and will be moving outside soon.) If one of us is in the fields, we might not be able to stop and talk, but you are always welcome. Remember your reusable bags and also to sign in when you pick up your share. We have plastic bags for you to use and as usual will also have reusable bags for sale in the shareroom. The bags we sell are the same size as the plastic ones we supply for figuring amounts of veggies in your share. Feel free to ask one of us for details. A few years ago we assembled a CSA Member Handbook to answer common questions and help make being a part of the farm as great an experience as possible for you and the rest of your household. It contains info about logistics on the farm, and lots of tips for U-Picking, storing and preserving the farm’s bounty. It is now available online on our new “Information for CSA Members” page (click here), but we have lots of hard copies too. We’ll be handing them out this week to new shareholders to take home and read; if you’ve gotten one before but would like another, please take one. When you come to pick up your share, please sign the sign-in sheet on the table inside the barn door. This helps us know how many people came each day, so we can be sure to pick more than enough for everybody. If you split a share, please sign in on the same line as your share partner. With your support of the farm, each year we are able to donate 4-5,000 pounds of fresh produce to the Northfield Food Shelf. These veggies are simply the leftovers from the share pickups, the same fresh, high quality food that you get in your share. With the help of a few very dedicated volunteer drivers, it gets delivered to the food shelf the next day. So if at any time you do not want to take all that is yours in the share pickup, you can leave it and it will go to the food shelf to help feed those in need, an unfortunately growing number of people in our community. Separate from these donations we also are pleased to sell produce to the Emergency Foodshelf Network, through their unique Harvest for the Hungry program. Last year was our first year participating, and we look forward to being able to continue supplying more great food into the hunger relief supply chain for the metro area. It is a solid win-win. Harvest for the Hungry purchases from local farms are all funded by donations, if you are so inclined your donation makes a direct difference for both local farmers and folks who struggle to put meals on the table. All buildings, except the shareroom area of the barn, are off-limits to children. This includes the new tractor “greenhouse” (though it looks like fun in there!) There are sharp tools in many places, of all shapes and sizes. Also stay a good distance from the beehives so they don’t think you’re a bear. We love having all of you come to the farm and hope it can be safe and fun for all! Thank you for making it such a great place to be! Crust: Place all the ingredients in a pie pan. Mix with a fork until well blended, then press over the bottom and up the sides of the pan. Flute the edge with your thumb and finger. Filling: Preheat an oven to 400 degrees. Heat the oil in a skillet and saute the onion and garlic until translucent, about 5 minutes. Add the greens and cook until wilted. Set aside to cool slightly. Beat the eggs and milk in a large bowl. Mix in the salt and the greens mixture. Pour into the crust. Sprinkle the cheese on top, pushing slightly into the egg mixture. Bake until a knife inserted into the center comes out clean, 30-40 minutes. Toss the lettuce, radishes, and turnip together in a salad bowl. Remove the trout flesh from the skin and crumble into the salad bowl. In a small bowl, make a dressing: whisk together the wasabi powder and water; stir in the garlic scapes, honey, vinegar, and soy sauce; add the orange juice and stir well; and slowly pour in the sesame oil in a steady stream, whisking constantly. Pour the desired amount of dressing over the salad, toss well, and sprinkle with sesame seeds.